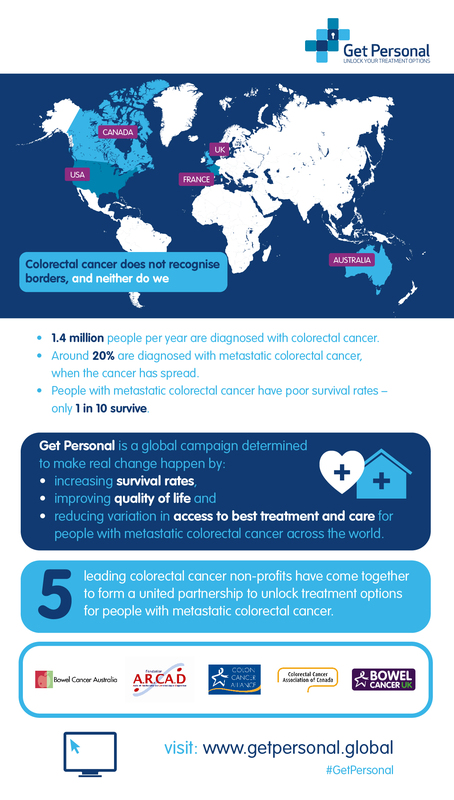 [27 September, 2016] Today is World Metastatic Colorectal Cancer Day. A day dedicated to raise awareness of the most advanced form of colorectal cancer, known as metastatic colorectal cancer; this is when the cancer has spread to other parts of the body, such as the liver or lungs. Deborah Alsina, Chief Executive of Bowel Cancer UK, said “With timely access to effective treatment and high quality care, people with metastatic disease can see their survival chances and their quality of life dramatically improve. But for too many patients, access to treatment is dependent on whether they have adequate insurance or if their public health system has approved specific treatments, rather than what their doctors and healthcare providers believe would benefit them most. Today, we are proud to have launched Get Personal along with partner charities from around the world to campaign for everyone to have access to effective treatment and best care irrespective of where they live”. Read our full campaign briefing here.